Guarianthe skinneri 'Casa Luna' AM/AOS. 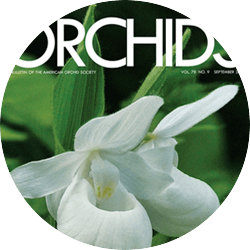 Although we often dedicate this feature to somewhat obscure or little known orchids, here we will cover a species that is very well known and deserves to be in every orchid collection. 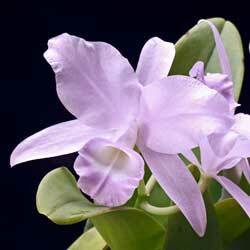 While still called Cattleya skinneri by many, Guarianthe skinneri was segregated out of Cattleya by Dressler and Higgins, along with other Central American cattleyas, in 2003. The earlier name was published by James Bateman in 1839 in Orchids of Mexico and Guatemala. In a rather lengthy dedication to the honoree, George Ure Skinner, Bateman closes by saying, "…we can therefore do no more than select some species which may not do discredit to his name, and we confess we are unable to conceive one better fitted for our purpose than the magnificent Cattleya represented in the accompanying plate." Skinner ran a mercantile business in Guatemala and had been asked by Bateman to send plant samples to England for identification. His contribution to science has been acknowledged by the names of a number of other orchids including the equally fabulous Lycaste skinneri. The range of Guarianthe skinneri extends from the southern Mexican border into Costa Rica where it is the national flower. There it is known as "Guaria Morada" and plays a role in local folk tradition. Plants are typically found in humid forests at moderate elevations growing on trees or rocks. Often, trees are deciduous in the habitat, providing a clue for this orchid’s culture. Gur. skinneri 'Yolanda Cuesta' FCC/AOS. Gur. 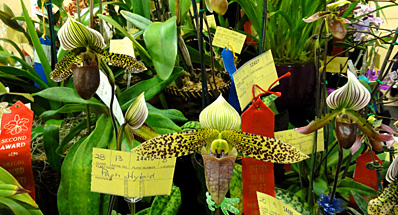 skinneri is a popular orchid to grow, especially in warm areas of the US like Florida and the Gulf Coast. 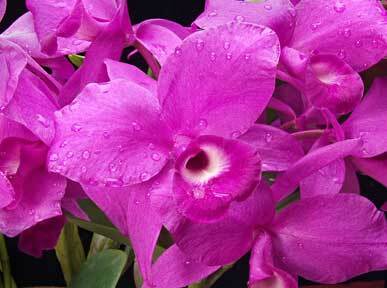 There are a number of color forms in addition to the typical orchid-lavender, notably alba and coerulea. Albas are often not true alba and have some pigment deep in the throat. There is also a well known natural hybrid with Guarianthe aurantiaca known as Guarianthe × guatemalensis. Colors of the hybrid are variable and range from coral through cream-colored. One could make an impressive collection of nothing but the two species and the natural hybrid. As you might expect with such a popular orchid, Gur. 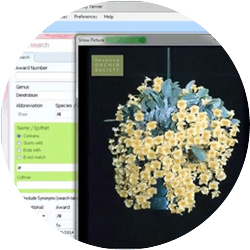 skinneri is highly awarded with nearly thirty flower quality awards and numerous awards for culture. 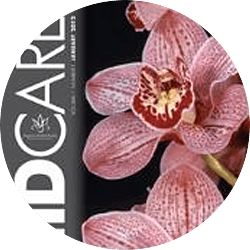 If you are looking for a showy, spring blooming orchid of easy culture, you cannot go wrong with widely available cultivars such as 'Carpinteria ', 'Heiti Jacobs ' or 'Casa Luna '. Of course, one of the most attractive characteristics of this orchid is that even un-awarded examples can put on a spectacular display. In 1984 we hosted an out of town couple who were in Florida for the 11th World Orchid Conference. 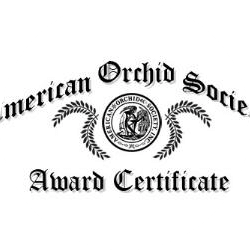 She was then an AOS judge and had met her recently wed husband at an orchid society meeting in Louisiana. She recounted seeing an early plant he brought to a society meeting, a Gur. skinneri. With a laugh, she recounted telling him that a well-flowered Gur. skinneri ought to "look like an azalea bush." 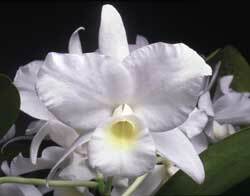 For the hobbyist with little experience, that is not a difficult goal to achieve with this orchid. 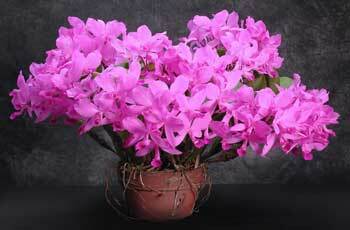 While standard "cattleya culture" will do fine for growing Gur. skinneri, a few suggestions will help flower it to its fullest potential. 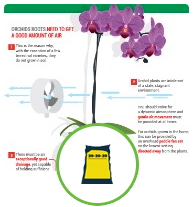 This is an orchid from low to moderate elevations and requires warm to intermediate conditions. That means daytime temperatures can be well into the eighties, but nights should not go much below 50º F. That being said, here in South Florida we see summer days into the 90’s and we do not protect plants in winter unless nighttime lows are forecast to be below 40º F. Like any orchid culture, individual growing conditions will dictate actual cultural factors. 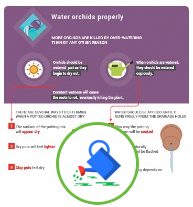 Grow plants on a wet-to-dry cycle in spring and summer with regular fertilizing every week. That is, don’t water plants until they are just about dry from the previous watering. We find that this species does better in a coarse, fast draining medium. In years past we used coarse tree fern but now use Styrofoam peanuts or chunks of hardwood charcoal (not briquettes!) topped with a layer of medium bark mix. You can also use aggregates such as lava rock or large Aliflor, just be sure to flush pots with clean water regularly to prevent salt buildup. Early on we learned that flower production was much improved with Gur. skinneri if plants were given cooler, drier conditions beginning in mid-autumn and extending through winter until blooming. Increasing light at this time improved not only flower count, but richness of color. Of course this makes sense. Plants from deciduous forests receive more light in winter. How much more? Whereas leaf color should normally be a nice grass green, providing enough winter light to turn leaves yellow-green without burning is optimal. 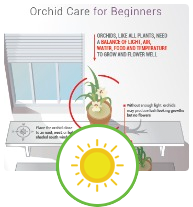 For those who live in temperate areas, plants will appreciate the summer outdoors in a location providing bright, filtered light. March is the blooming season for Guarianthe skinneri so if you have plans to attend an orchid show in the next few weeks be on the lookout for blooming plants and try one…you’ll like it!